Banning Eyre is one of the foremost scholars in the West on African Music. It is difficult to choose what he is most acclaimed for but his lead production position with the Peabody Award-winning Afropop Worldwide radio program and the production of their website is up there. The guitar playing author has been featured in The Boston Phoenix, Guitar Player, Global Rhythm, fRoots (Folk Roots), Songlines, The Beat, CD Now, CMJ, salon.com, Music Alive, New Music Monthly, Music Hound and All Music Guides. He also published books about Mali and Zimbabwe after a trip there decades ago; more on that to come. We spoke with Banning about his most recent book Lion Songs: Thomas Mapfumo and the Music that Made Zimbabwe. In addition to their history together, Banning spoke about the challenges of writing about the ever-shifting political landscape of Zimbabwe, bringing African music to a mainstream Western audience and living in exile. 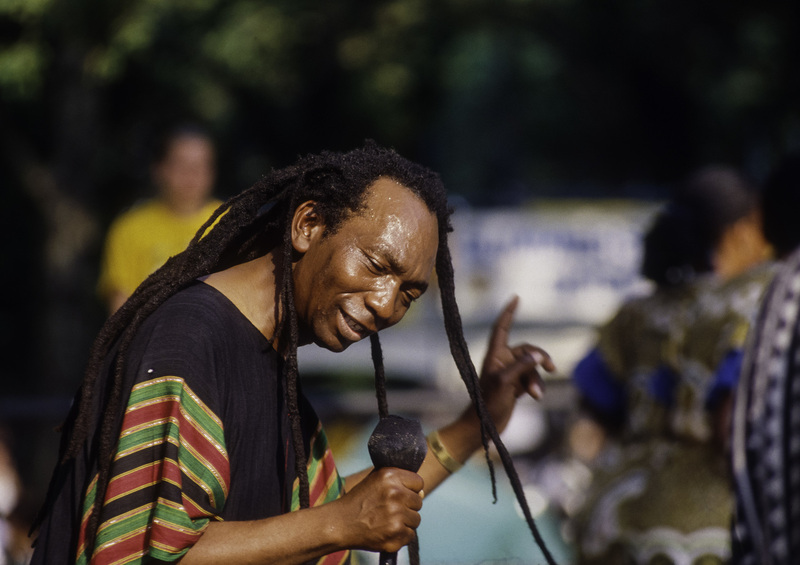 The book can be purchased from his website with an accompanying CD featuring 23 essential Mapfumo songs to know. ShelfieGeneration: Banning, thank you very much for speaking with us today. 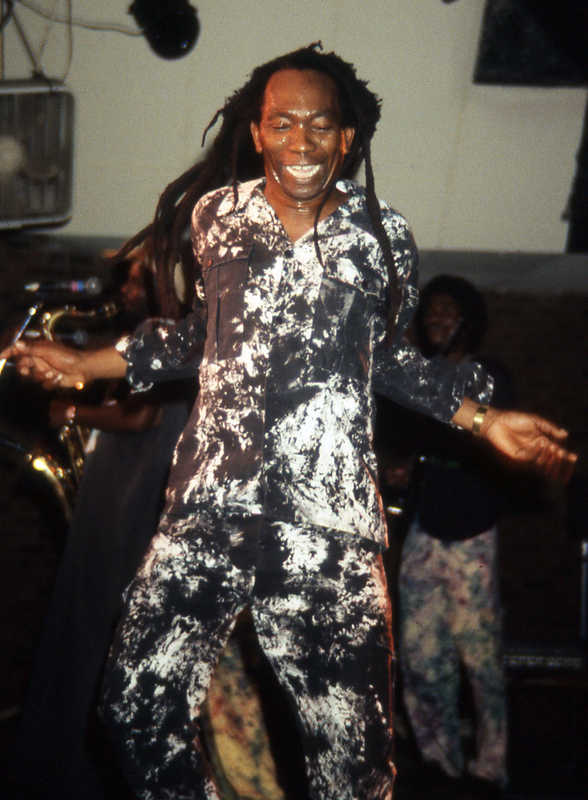 To start things off, could you outline your relationship with Thomas Mapfumo? How did you meet? SG: So when did you decide to write a book about Thomas? BE: It was when I went back to Zimbabwe in 1992 that I really set on the idea of writing this book because I realized that, first of all I had unique access to the story and second of all, it was a very complex and interesting story. The more I learned about it, the more I learned that not only did it have all of these connections to religion and spirituality and spirits and you know, deep African religion but it was also tied into the revolutionary history of the country which had been a political struggle to get rid of the Rhodesian settlers, occupiers, colonists, however you’d wish to characterize them. But it was also this whole mission to recover the stigmatized culture because Rhodesian educators and missionaries had really worked very hard to stigmatize the kind of beliefs and practices that went with Mbira music, and other things. The whole package was just so fascinating that over the first few years it became something very big. It was personal connection, it was a musical fascination and it was a sense of this big complicated, important story. It all just kind of came together and that’s why initially, I felt like I had to do this. I actually remember a moment in that second visit in 1992, so it had been 8 years since I first heard their music and 3 years since I first met the man and the band. He had already toured twice, I think, in the US by then. So a fair amount of time had gone by and I remember actually being on stage with the band and playing the music and looking out at the crowd. Just sort of being in that moment. It struck me, I remember it actually as a moment, “This is a book. This needs to be a book. This has got so much dimension to it, so much depth, so much complexity, so interesting.” I had just come from Mali where I had a similar type of experience. I wanted to write books. I was looking for big subjects. I realized on that trip, spanning first a month in Mali and then Zimbabwe, that these were the two subjects I wanted to write about. That I was going to write books about both of them. It took a long time, especially the Zimbabwe one, but yeah, I do actually remember this moment on stage where it all kind of came together. SG: The literary landscape has changed a lot since 1992. The musical landscape has changed a lot too. How we shared information was so different from how we do now. How did your view of these books reflect those changes? In 1992, you said, “This is a book.” If it happened in 2016, would it still be “this is a book” or would it be “this is a podcast” or “this is a documentary”? BE: That is a very good question actually. Like I said, I never let go even though a lot of things changed for me. The Mali book happened in a fairly predictable, organized way. The Zimbabwe thing dragged on for a long time, the Mapfumo book Lion Songs, because so many unexpected things happened. Ending up with him in exile in the US… It just was impossible to finish the book because I kept doing more research. But now, today, now that I finally have reached the end of the long-ago conceived plan, I am not so interested in writing other books. I have some other ideas for books but I kind of feel like there are other medias that I would like to speak through. I’m not going to go a lot into detail about that because I have some ideas that are kind of ambitious that are so young, that I can’t get into it. But your question is apt because I kind of feel like while I am really proud of these books and while I expect that they’ll last a while and be read for a long time, they don’t have much chance of reaching the kinds of larger, general American audiences that I would love to reach. So I’m trying to think about ways to go further, to convince more Americans of why the whole subject of Africa and its interactions with America are so important and so interesting. I think if everyone read this book and my Mali book they’d sort of get it but I know that’s not likely to happen. So I’m trying to think about ways to use current trends and technology and cultural dissemination avenues to do it in a different way. So without getting any more specific, I take your point. It’s a good question. SG: You said that the Mali book’s process was pretty straightforward while the Zimbabwe one had lots of complications. I was wondering, specifically, some of the other differences between these two books? What did you learn from the first one and how did that impact the process of the second? BE: [In Griot Time] had a narrower focus. It was really about a 6-month period of time that I spent being a guitar apprentice in Mali. I prepared myself a little bit better for the Zimbabwe trip by doing more research before the trip. But that was kind of the reason it got more complicated because I started getting into all of the nuances of the history and I wanted to really tell a story that was much bigger than my encounter with the music. I wanted it to be a fuller account of the country and history. So that was one of the reasons it got bigger but the other reason is just the difference [between] the places, their histories and the things that happened while I was writing. I mean, Mali has been through some very tumultuous events just in recent years but up until January, 2012 the world that I described in that book was pretty much what you would have found if you went to Bamako. And even now, I mean we were just there a few years after the crisis and life is returning in some ways. It is not dramatically different than the world I describe. Where as in Zimbabwe, I witnessed real transformation of the life of the country. It was so happening and so hopping with music when we first went there in 1987-8 and there was such optimism, everyone really believed in [President Robert] Mugabe. Then all of the terrible events of the 90s and 2000s happened. The devastation of AIDS, the total refusal of the government to deal with it in a way that may have mitigated the situation until it was far too late, the toll that it took on the community of musicians and people that loved music, and then, just the economic devastation. Mugabe’s insistence on hanging onto power, his willingness to sacrifice so much of the country’s livelihood to achieve that goal, the farm seizures, just the bitterness that grew in that environment really changed the character of the country and the character of the music. I haven’t been to Harare in a long time but I do talk to people who go there and I know it’s a very different scene now than it was then. In the case of writing the book, I was always trying to figure out ‘why is this country the way it is? What are the particular things about it that made it this way? That drove me deeper to try to understand Shona culture and try to understand the nature of the colonial experience, I put a lot of weight in the book on the way that Rhodesian education stigmatized culture and really tried to make people ashamed of their culture and ashamed of who they were. That is just so radically different than Mali where people to this day dress traditionally on the street. They have all kinds of traditional manners of speech and music styles. Even though you have rap, hip-hop, electronic music and everything happening. you still have Wassoulou music; you still have griots. Things get added but they don’t get taken away. There’s this really durable sense of pride in people and who they are [and] their knowledge of history. All of that is much more interrupted in the Zimbabwe context. It really was a powerful lesson for me how big of a difference that makes. Then you think of the African-American situation, of people being completely separated from their sense of history and knowledge of who they are and it begins to make you understand why things are so difficult here. SG: The word ‘exile’ is used to describe Mapfumo’s current circumstance. I believe that exile is a powerful word with specific connotations. I also assume that it was a justified, conscious decision. 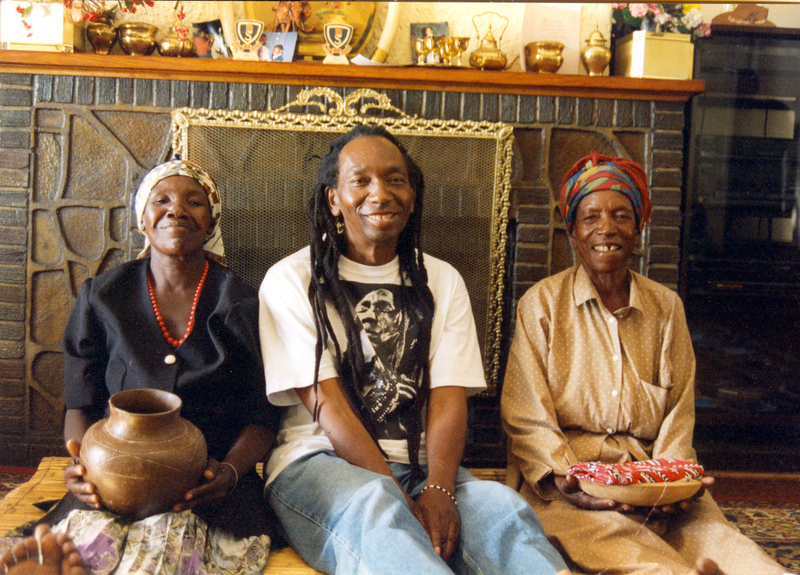 Can you speak about Mapfumo’s life in the West? There are musicians who go overseas to just to have more opportunity and some of Thomas’s many detractors try to depict him as being that. “Oh he makes up these stories about how he was threatened, about how he was in danger but really he just wants more opportunities.” They used to say that in the beginning but I think now it is more clear. It’s not like he made it big in America and is living high on the hog. If he were, I think that line would be being pushed harder. It’s a very different thing than Senegalese or musicians from Mali who go live in Paris because they can make more money there and have more contact with producers and record labels. I think there was a lot of that in the 80s and 90s but not as much now. I mean the whole world of musical careers has changed so much. The whole dynamic, all of the mechanisms are different now but there were a lot of people who did that. What Thomas has done is much different. I don’t think he ever had that sense to strike it rich in America. As Al Green memorably said, it’s about protecting his family. SG: Has his move to the United States made it easier to stay in touch? Are you still in contact with Thomas much? BE: Yes, in fact I’m going to see him in about 10 days. He is coming to play two East Coast shows on April 2nd and 3rd and I will see him. I played with him in Ohio and Chicago last summer. You know, we talk on the phone pretty regularly. It’s always great to see him. He was not happy with the book initially, especially when he saw a not-final draft of it. We went through a tough time but that is pretty much behind us now. We are on good terms. SG: Wow, I’m glad to hear you are on good terms. I wanted to ask about that actually. It comes through your book that it could be difficult for the people in his life to work with Thomas at times. I honestly find that to be true of most exceptionally talented people. What was your experience with the more difficult side of Thomas? BE: Well, there were two times in my life with Thomas where we really came to some loggerheads. One, in retrospect, was pretty minor. I have this band and we play kind of our own version of Zimbabwean music and I gave him the CD that we recorded about 8 years ago. He didn’t like it at all; he took great exception to it. He was really critical of how the people were singing in Shona and feeling like he should have been credited on certain songs. There’s a whole thing about traditional songs and a lot of people think that Thomas is taking credit for songs that are just part of tradition so we ran afoul of that. It was a whole lot of tension back-and-forth for a while but it passed. Actually, I don’t think he ever really warmed up to the music of the band but he became friendly with the people of the band. Thomas can really make a big huff and make a big scene about things but then he’s very often willing to, once he’s had his angry say, kind of let bygones be bygones and move on. I have seen him repair a lot of relationships that didn’t seem repairable at the time. The bigger one was when he saw the book. I had a different ending when he saw it; it was a darker ending. And well, he took exception to all kinds of things at first. He didn’t think it should be noted that anyone had died of AIDS because you didn’t know for sure if that was how they died. He didn’t want any personal details about his family in there. It was difficult because I really had to stand my ground. I really had to say, “Look Thomas, we’ve been working on this for a long time. I can change some things but I cannot change the basic nature of the book.” And you know, he had to go through his own process of accepting what kind of a book this was going to be. That wasn’t easy. It took time; time was really the key factor. I also made some changes. I tried especially as I could to honor his sensitivities in ways that made the book better and deeper rather than feeling like I was pulling punches. In the end, I think he ended up feeling great about it because he got a lot of really good feedback when the book came out. A lot of people around him, it was a whole process, helping to convince him that he really should be glad, that he was lucky to have this book come out. I think it did change our relationship in some lasting ways. There were some very intense discussions and angry words spoken and I don’t think those are completely forgotten. I kind of anticipated it. I knew there would be something like that. It was more intense than I anticipated when it actually happened but like I say, time kind of worked its magic and I think he’s glad the book exists. BE: We do talk about it. There isn’t really a whole lot new to say from his point of view. He has dug in pretty deep that Mugabe’s people are totally corrupt and self-serving and they need to go. There is no way he is going to come around and say that well maybe they aren’t really that bad. He’s basically just waiting for Mugabe to be gone so that he can go home. When we do talk it’s usually about the ins and outs of the succession. Although the last time I spoke to him we actually spent the whole time talking about Donald Trump. Other Zimbabweans have drawn parallels between Mugabe and Trump because they are both masters of the cunning insult. They both really know how to get under the skin of their adversaries. I mean, Mugabe was always really good at that. He always knew just what to say about each adversary to really piss them off. And we noted that Trump also has that talent. SG: I’m not sure what kind of sign that is when the American political cycle and its candidates outdo Mugabe in a discussion of that nature. BE: We are living in very strange times. That’s for sure. I think even he is kind of amazed by it. He said something to me in my last conversation that I found kind of disturbing. He said that the Trump campaign is showing, and he actually said most or all, but I would say a lot of Americans really do hold on to these very racist ideas and they’ve just been biting their tongue. Here comes this guy that kind of makes it okay to put it out there. All of this disguised racism is coming to the surface and that is pretty horrible. SG: Thank you so much Banning. Again, we really appreciate your taking the time. BE: Of course, thank you too. Purchase all of Banning Eyre’s books, listen to music and check out photos from his trips through Mali and Zimbabwe at his website. All photos from Banning Eyre’s website, ALL RIGHTS RESERVED. ← ShelfieGen Review: “Democracy in Black” by Eddie S. Glaude Jr. Thank you! What types of posts would you like to see on ShelfieGeneration in the future? More author interviews? Welcome. Post what moves you not what people tell you to do. I definitely approve of that sentiment! Are you currently reading anything that you would like to share? ?